Fine art photographs of starry skies over North America. 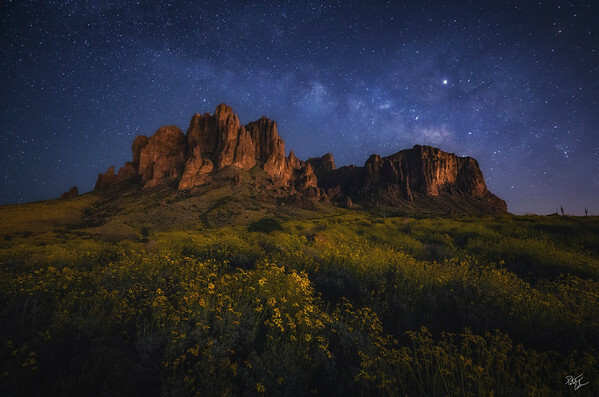 A blanket of gold brittlebush blooms sit beneath the Superstition Mountains as the milky way rises above early in the morning. The light on the landscape is from the nearby city lights casting its glow on the mountain as they do every evening. 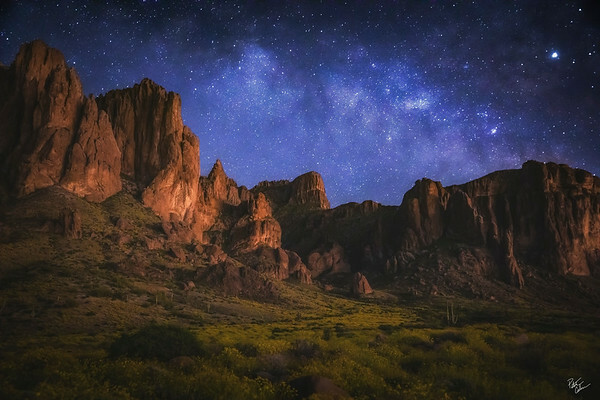 The galactic core of the milky way rises over the iconic flatiron in the Superstition Mountains. This is my first attempt at a zoomed in milky way photograph as I have almost always used a wide angle lens to capture the night skies. The vibrant milky way and giant sandstone spire rise in unison in the remote Arizona desert. The milky way and night sky reflect in a small pool over stunning rock formations in the remote Arizona desert. 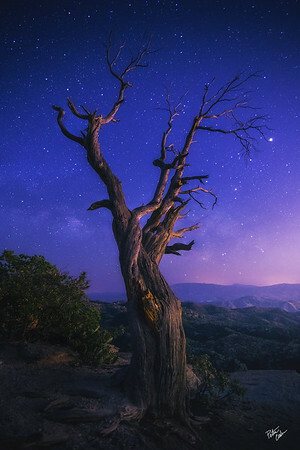 A gnarled tree rises into the night sky high above the city of Tucson. The milky way begins to rise above the distant hills and mountains. 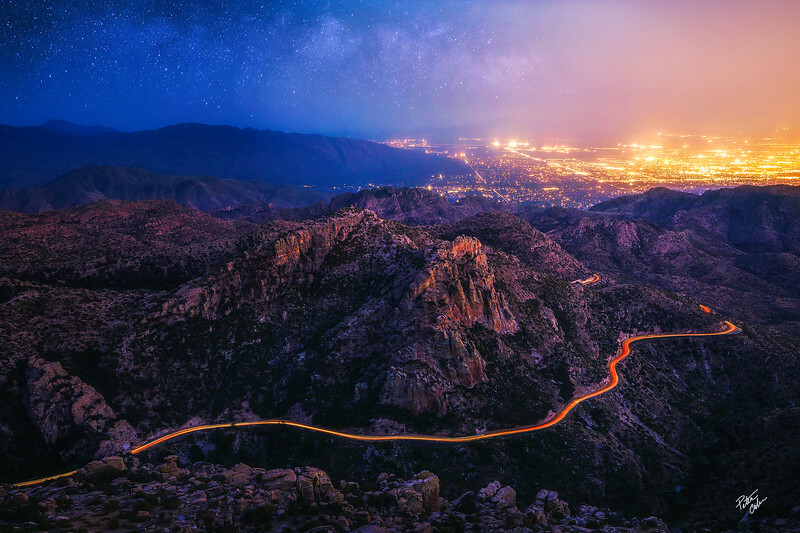 The milky way rises over the city of Tucson and the Catalina mountains as cars make their way up and down towards Mount Lemmon. 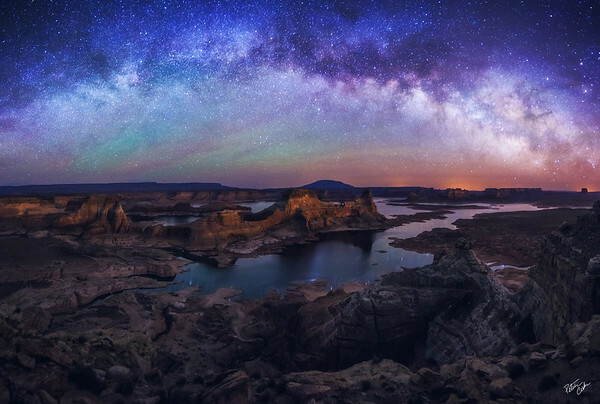 The milky way rises over Lake Powell and Navajo Mountain on the Arizona Utah border. Green hints of airglow and the distant lights near page create a mosaic of colors in the night sky not often seen. 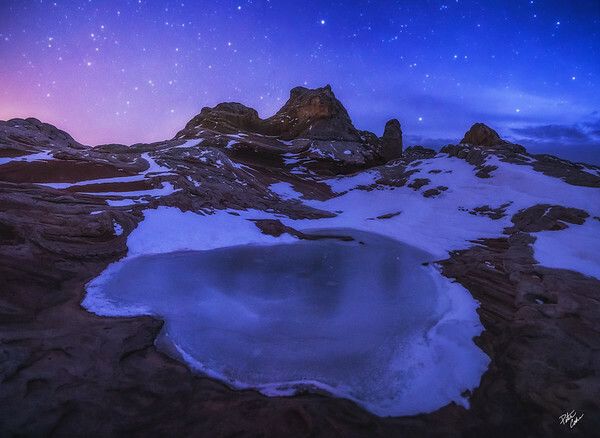 A break in the clouds reveals a blanket of stars over this frozen desert landscape. 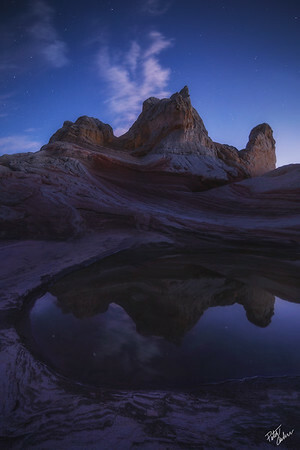 Fading sunset skies give way to a blanket of stars above remote rock formations in Northern Arizona. 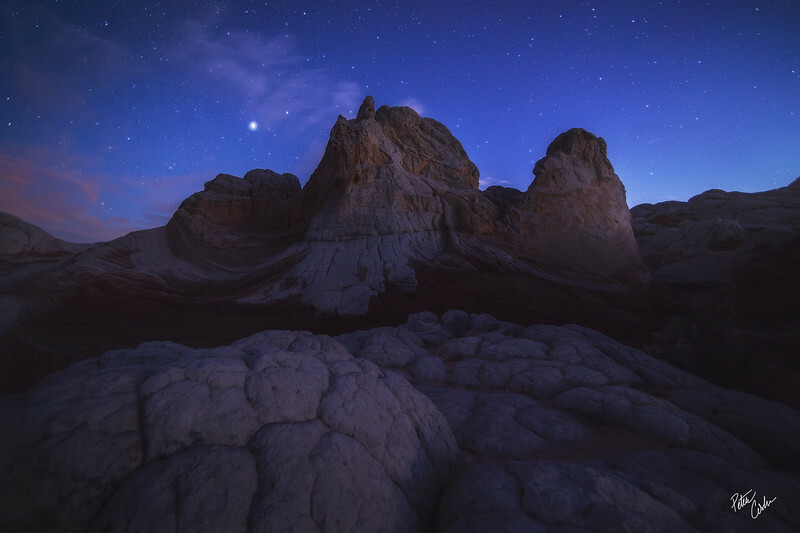 The last glow of light gives way to starry skies over this remote sandstone landscape. 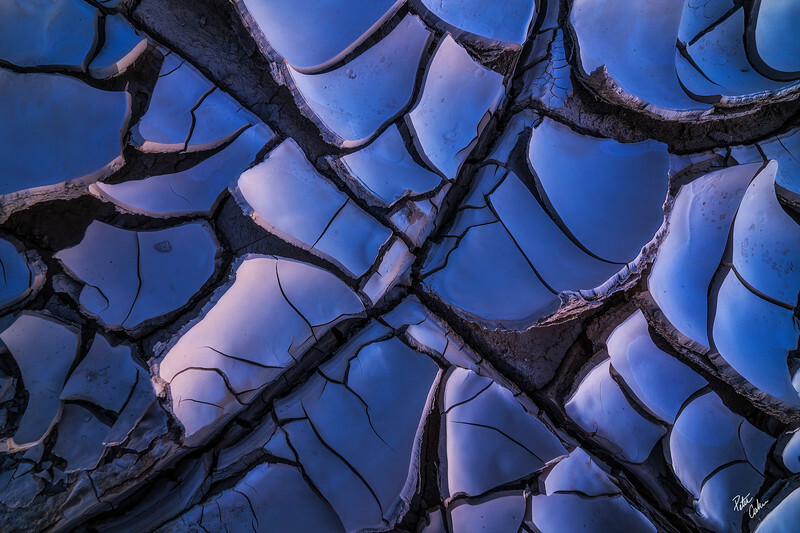 A pool of water gives a mirror reflection of the rugged rocks. 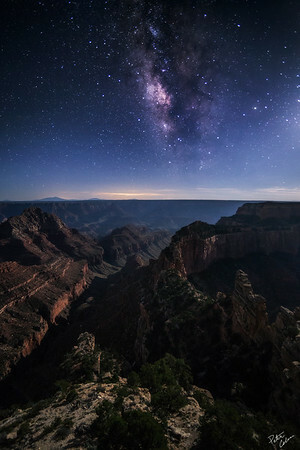 The vibrant milky way rises vertically above cape royal on the north rim of the grand canyon. The crescent moon provides enough light to illuminate the inside of the canyon. 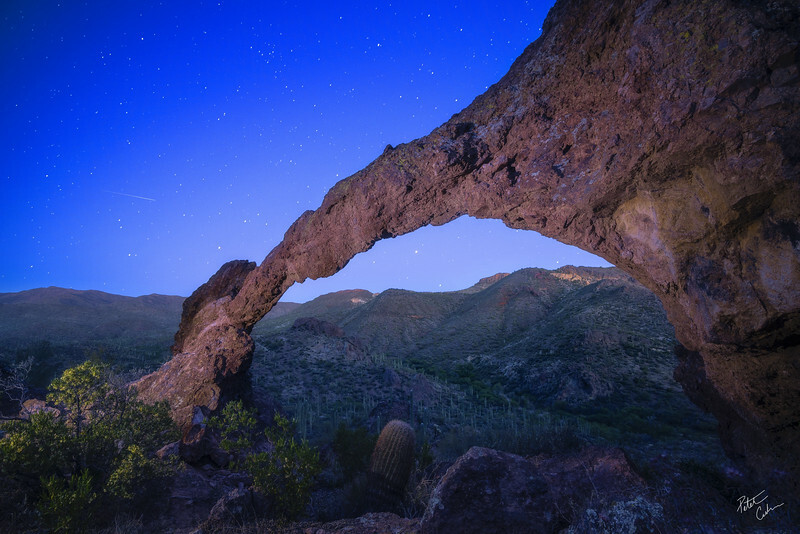 A rarely seen arch in the superstition mountains light painted as the stars begin to emerge in the sky.